Some people refer to binary options as a game while other refer to them as a financial instrument. Both definitions have their merit and I personally prefer to look at binary options as something in between a gamble and a financial investment. They do not have any value if they expire outside the money so I do not feel that it is correct to look at them as an investment but they are not really casino games either. They have just as much in common with regular options as they do with gambling. But then again, all speculation is a type of gambling. Most binary options brokers use licenses from Malta or Cyprus who both consider Binary option to be financial instruments and the licenses are issued by the SEC in each of these countries. Isle of man on the other hand consider them a type of gambling and regulate the trade under Isle of Man Gambling Supervision Commission (GSC). Binary options can be a good way to earn money from home. This is true regardless of whether you consider them gambling or trading. Binary options can only be traded online. There is no offline establishments for binary options trading. Binary options allow skilled traders to make a lot of money. Binary options are based on other financial instruments. Different options are based on different financial instruments. Examples of common underlying financial instruments includes shares, indices, commodities and currency pairs. 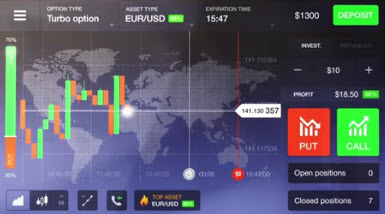 It is the market movements of the underlying financial instrument that decides whether a binary option matures in the money or not. There are a number of different types of binary options. They all work slightly differently from each other but the goal for all of them is to predict the future market movements of the underlying financial instrument. A classic binary option asks you to predict whether the value of the underlying financial instrument will be above or below a certain level when the option matures. If you are correct then you get a large predetermined profit. You know how much you can earn when you buy the option. If you are wrong and the option matures outside the money then the option is worthless and you have lost whatever you paid for it. A binary option does only have two outcomes. You make a large profit or you lose your entire investment. The outcome is in other words “binary”. You can usually not sell a binary option until it has matured. Once you bought it is yours for better or worse. Binary options are not traded on any open market. If you want to trade with binary options you need to open an account with a binary options broker. If you consider binary options gambling then you would describe the broker as a book maker. The broker creates all the options and decide which option he wants to offer the traders. Different brokers specialize in binary options based on different kinds of underlying financial instruments. It is therefore very important that you research your broker before you decide who you want to trade with. Make sure to choose an honest broker that offer a large selection of binary options based on the type of underlying financial instruments you want to trade with. Never chose a broker that specialize in binary options based on commodity pairs if you want to trade with stock based binary options. If you do you will find a very small selection of options that suits your needs to trade with. I recommend that you use a reliable broker review site to find a broker that is a good fit for you. It is very important that you understand how binary options work before you start trading with binary options. There is no open market where binary options are traded. You can usually not sell them once you have bought them and there is no third party involved. Buying a binary option is a transaction between you and your broker. No one else is involved. The broker earns money when you lose money and lose money when you earn money. Binary options are designed to earn the broker money. You need to be skilled at picking the right options to buy if you want to be able to earn money. Think of it as sports betting. The system is designed to earn the sports book money but skilled punters can earn good money by placing skilled bets.